There is nothing so important to a Road Warrior as knowing what kind of weather lies waiting up ahead. It can determine your mode of transportation, your dress-code for the day...even the tech-kit that you pack. It can have a profound effect on the schedules of yourself and those you are meeting, and generally mess up the best laid plans...(etc., etc., etc.). xWeather is designed to deliver current weather conditions, 5-day forecast summary, detailed forecasts and configurable radar and satellite weather maps. It does so with an elegant, tabbed interface whose functionality is 100% integrated with the Treo's D-pad. The application allows you to pull weather information directly from the NOAA (National Weather Service), or Yahoo! Weather. You can create an almost unlimited number of profiles, and activate/deactivate them according to your needs. If you look at the top graphic, you see the default screen of xWeather. This view shows current conditions, with your short-term forecast scrolling neatly below. At the bottom of the screen, is a banner which will show green if there are no current weather alerts, and red if there are. If it shows red, then just click on the banner to see the alerts in their totality. A picklist above the tabs shows the current weather profile. Just click on it to select another. The second graphic shows the 5-day forecast summary. Explicit icons and crisp fonts combine to make 'weather-at-a-glance' a reality. You see the icon, day-of-the-week, forecast condition (e.g., Partly Sunny) and the high & low temperatures. If you click the D-pad's center button, a new screen opens up (see the third graphic), which shows you the detailed forecast for each day. Using the D-pad, you can quickly jump back-and-forth between the 5 available forecasts. Using the D-pad to jump down to the 'OK' button closes this view, and takes you back to the 5-day summary. The fourth graphic shows you the 'Radar' tab. As a default, xWeather provides the latest Doppler radar map of the entire continental USA. When in this view, click on the D-pad's center button to bring up xWeather's 'zoom' control. This will allow you to zoom in-or-out using the D-pad. Once at the desired zoom level, you can use finger or stylus to move the map to the exact section you want to view. You have the ability to enter the URL for a specific map or graphic into both the 'Radar' and 'Satellite' tabs; and, then have xWeather get the latest version, when updating that profile. For this profile, I replaced the default Radar and Satellite maps with maps from Weather.com that center around my home. The Radar tab shows the 100-mile Doppler view, while the Satellite tab shows the 300-mile view. All in all, its as robust, and simple as can be. As I mentioned earlier, xWeather is my main weather app; but, is not my only weather source. That's because I require access to an animated Doppler map (so I can see if an incoming front is headed towards me or my destination); but, xWeather doesn't support GIF files. If I am going to be on the road all-day, I like to know what the weather and temperature is going to be like hour-by-hour, at my different appointment locations. This is another type of weather data that xWeather does not provide. 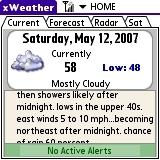 xWeather was designed for the Treo smartphone, and supports the Palm Treo™ 600, 650, 680 & 700p. At $12.95, it provides seriously useful bang for your hard-earned bucks. If you need maximum weather information for multiple locations, and want it made easy...then, you owe it to yourself to give xWeather a test drive. After a year of dozens of locations, thousands of miles and lots of weather, xWeather has the right stuff, and remains a Treo Editor's Choice.